The follow through position is the “end of the swing” and by that I mean, it’s when you are done with all the critical movements and the rest of it is just a way to absorb force and have a gentle landing. What takes the club up from here is the speed that you have applied through the ball. Contact issues can arrive for golfers who try to force a finish position. The follow through position has a couple really critical things to monitor. The right side bend is going to continue from impact. It is not until after this position that you should start to stand up out of your side bend. This is what gives the appearance of maintaining a spine angle. In addition, the spine will be extending and the pelvis will be posterior tilting, tucking, or extending. The reverse crunch continues, but the extension of the mid spine creates the look of a reverse C. The critical component is to make sure that you are using your hips to initiate the extension and not the lower back. This piece creates a stable plafform for your arms to accelerate away from through impact. It is like pulling the hand back to snap a towel and will help create speed in the release when we get there. The last piece of this follow through checkpoint is learning to extend the arms without collapsing the wrists. Some schools of thought refer to the angle of the wrists as the flying wedge and is a key component to controling the apex. The consistent pattern that I see between impact and follow through is a consistent narrowing of the elbows. The elbows at this point should be as close together as you can get them without collapsing your shoulder blades, this involves both straighting and a rotation of the left forearm. If you do it with the right arm, then the bottom of the swing will tend to move backward. Keep Focus Through The Shot Losing focus during a swing is a recipe for poor performance. Keeping the Lead Arm Straight? 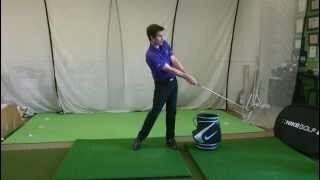 - Member Question Should you keep your left arm straight the whole swing is answered in this GSA Insight. SAMI - Elbow Separation Use the SAMI to monitor your elbow movements during the golf swing. Insight - Going Normal In Golf What does it mean to go normal? Are there different ways to define it? Find out this and more in this video.